Artist's conception of a powerful magnetar. Image credit: ESO/L. Calçada. A UK-German team of astronomers has conducted observations of a peculiar radio magnetar known as XTE J1810–197, which turned on in December 2018 after an almost decade-long period of quiescence. Results of these observations provide more information about the magnetar properties, and were presented in a paper published March 6 on arXiv.org. Magnetars are neutron stars with extremely strong magnetic fields, more than quadrillion times stronger than magnetic field of our planet. Decay of magnetic fields in magnetars powers the emission of high-energy electromagnetic radiation, for instance, in the form of X-rays or radio waves. 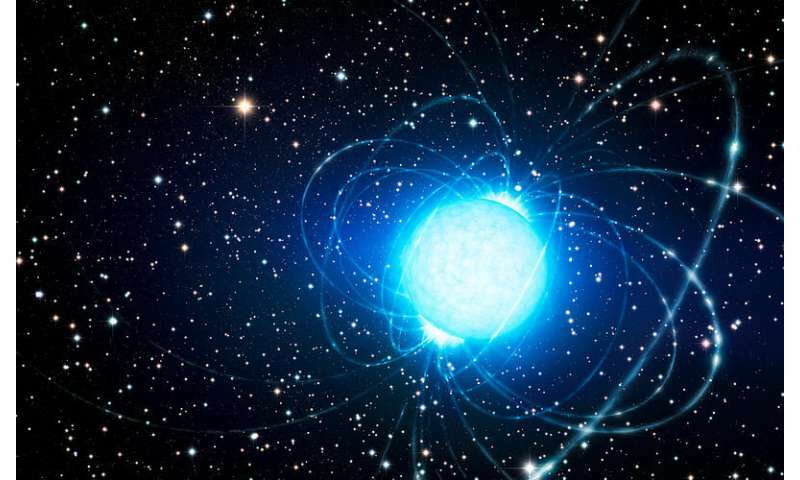 To date, only 23 magnetars have been identified and XTE J1810–197, with a spin period of around 5.54 seconds and magnetic field strength at a level of 2 trillion G, was detected as the first of only four known such objects to emit radio pulsations. Radio emission from XTE J1810–197 was discovered in 2004, one year after an X-ray outburst from this source was observed. The star subsequently exhibited highly variable pulsed radio emission until late 2008, when it entered a radio-quiet state. Anticipating radio reactivation of XTE J1810–197, a group of astronomers led by Lina Levin of Jodrell Bank Centre for Astrophysics at the University of Manchester, UK, began observing this magnetar in 2009 with the Lovell telescope at Jodrell Bank Observatory (JBO). On December 8, 2018, the scientists detected a bright pulsed radio signal at 1.52 GHz from this source, which marked the end of a nearly decade of its radio-quietness. "After spending almost a decade in a radio-quiet state, the Anomalous X-ray Pulsar XTE J1810–197 turned back on in early December 2018. We have observed this radio magnetar at 1.5 GHz with ∼daily cadence since the first detection of radio reactivation on December 8, 2018," the astronomers wrote in the paper. According to the study, the pulse profile of XTE J1810–197 has changed significantly since detection. However, the profile changes observed during the first two months since the reactivation were less extreme when compared to what was observed the last time when this source was active. "The pulse variations seen so far from the source have been significantly less dramatic, on timescales from hours to months, than seen in 2006," the paper reads. The researchers report that the magnitude of the spin frequency derivative of XTE J1810–197 has increased by a factor of 2.6 over the 48-day data set, with the most rapid increase occurring during the first 15 days. Moreover, the astronomers identified 50-millisecond oscillations seen in the pulse profile of the magnetar for about 10 days after it was re-detected. These oscillations have a characteristic frequency of 20 Hz and are seen at different frequencies and different telescopes at the same time. The authors of the paper assume that such oscillations could be related to surface waves triggered in the neutron star crust with a wide spectrum of frequencies. In concluding remarks, the researchers propose further monitoring of XTE J1810–197 in order to find out whether or not the pulse profile of the magnetar will experience more variations over time. Is this definitely a 'singleton' star, or could there be a companion on a decade-long orbit ?? well, it will be most tedious when the looneyticks pile out of their clown car, yo denounce the data collected & the conclusions derived from scientific research. The woomongers will insist that their drunken deities first plasmaspazzic aethernuttiness electrouniversilly sparkles magically produced the Neutron Star without any help from that nasty Big Bully Gravity. Which they will endlessly insist is created after the pretty lights. When their drunken deities beat their thundermugs on the tabletop in appreciation of the mesmerizing sight of the galvanic light show. Nik, ol'buddy. I regret that you misunderstood my intent. I will not pretend I am competent to answer your question. Which I consider a comment in good faith. I look forward ti the answers from the few Real Scientists who frequent Phys.org. Who have shown they are competent to answer you. Even if I fail to understand their explanation? I enjoy the challenge of trying! You probably find me a gadfly, adisruptive influence. Perhaps you should follow your compatriots who have set me to "ignore"? I promise I do not take offense at such a designation. I find it amusing. Yes, I do have a perverse sense of humor.. Frankly & Ernestly, if there is any basic intent on my part? I am devoted to my patron goddess, Trickster Coyote. She inspires my intense anger to the struggle against the flood of online frauds & fakirs, denialists & antivaxxers. As criminally traitorous bots & malicious agents of anti-science, anti-human propaganda.